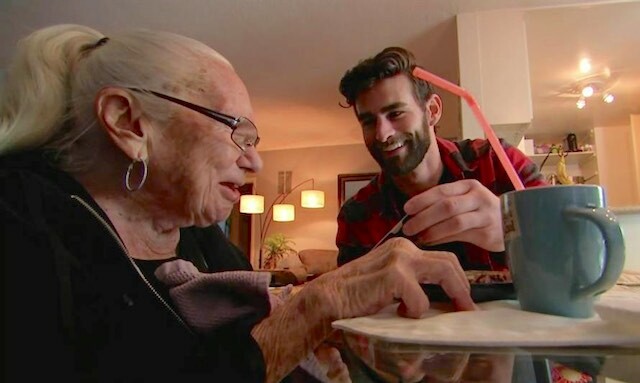 Even though 31-year-old Chris Salvatore and 89-year-old Norma Cook are vastly different ages, they are the perfect roommates for each other – and the best of friends. The duo first met about four years ago when Chris moved in across the hall from Norma. The two grew steadily closer as Chris continued to volunteer for tasks involving her home and medical care. His assistance was needed more than ever when Norma’s health rapidly started to decline over the last six months. She was hospitalized several times for pneumonia, asthma attacks, and sustaining nasty falls in her apartment. The bleakest news came when doctors said that unless she was given 24 hour care at home, she would be sent to a state care facility. Chris created a GoFundMe page which raised over $75,000 for private care — and, most importantly, invited Norma to live with him so he could look after her and cut her out-of-pocket costs. After the two became roommates, they realized it was a perfect match.